Coupled with rampant urbanisation, climate change is impacting severely upon the water-based societies of Asia, both from severe flooding and water shortages. Adapting to these complex challenges is often dominated by one-dimensional, centralised and ‘hard’ engineering solutions to water resource management infrastructure, developed by governments and technical experts. Such approaches fail to empower the community in developing solutions, with the result that local indigenous culture and knowledge of water management are overlooked. This article seeks to demonstrate that integrated, whole system, decentralised and inclusive approaches to water and related infrastructures may lead to multiple benefits. Not only may flooding be reduced, but social livelihoods and equity may be improved, economic prosperity and employment increased, indigenous approaches to water respected and supported, health and education improved, and eco-systems sustained. Moreover, such decentralised approaches are likely to be more cost effective than centralised solutions. A case study is used to illustrate how combining top down and grassroots approaches and applying integrated systems thinking may result in synergistic solutions with a number of co-benefits. Rapidly developing and low lying delta cities in countries such as Bangladesh are especially vulnerable to climate change, involving more frequent and severe floods. Because of dependence on natural resources and limited capacity to cope with the impacts of climate change, including ‘chronic inefficiency with institutional capacity’, Bangladesh has been identified as one of the most vulnerable countries in the world (Alam et al., 2015). As Rahman et al. (2007) pointed out, ‘the country faces too much water in monsoon causing floods and too little water in dry season’. It is projected that sea level rise will dislocate millions from their homes, occupations and livelihoods, and increase salinity. According to Parry et al. (2007), cited by Alam et al. (2015), a one metre sea level rise would lead to about 20 per cent of the country being inundated with saline water. In addition, this would impact severely upon poor and marginal groups (Rahman et al., 2007). The risk is increased by rampant urbanization, where green infrastructure (such as green space and water bodies) is often usurped by built or ‘grey’ infrastructure, including transport, drainage systems, housing, and commercial/industrial developments. Hard engineering approaches to urban development and infrastructure dominate softer eco-system approaches, with unintended consequences and reduced climate change resilience. As pointed out by Alam et al. (2015, 2012), grassroots responses, based upon age-old traditional practices, are ‘mostly effective as adaptation measures during typical hazards’ but ‘have limitations in extreme events’. To enable better adaptation to climate change challenges, Alam et al. (2015) argue for increased recognition of informal grassroots responses and their integration with development programmes and official climate responses. This provides the impetus for this article, which uses the City of Khulna, Bangladesh, as a case study in seeking to answer the following questions (RQs): What are indigenous and formal responses to climate change? To what extent are indigenous, decentralised responses integrated with formal, centralised responses? What are the potential benefits of integration in terms of resilience and co-benefits? Firstly, the article reviews literature related to water resource management in developing countries, including Bangladesh, and the severe challenges posed by climate change. International protocols and policy responses, which advocate integrated and inclusive approaches, are then outlined. The case study City of Khulna, located in a low-lying delta area of Bangladesh, is introduced and its development context and challenges described. Formal, institutional responses to improve resilience are then examined and compared with informal, indigenous practices, using documented reports, literature and local familiarity/observations. Next, the potential benefits of both integration of formal and informal approaches and integration of infrastructure systems are considered; not only with regard to improved climate resilience, but also socio-economic benefits. The findings are discussed, limitations and potential applications considered, and opportunities for further, more in depth research are outlined. Developing countries such as Bangladesh have a long-standing water culture, where the livelihood of communities is based upon water. Not only do water systems, channels and ponds function for drainage, irrigation and water storage for productive aquaculture, but also have cultural significance, with villages being structured around them. Despite the abundance of water, as the world’s largest delta, the country is experiencing a critical water crisis, with the lack of potable water creating health hazards. Moreover, as the rivers are silting up and being built upon, they are unable to absorb the rainfall, resulting in damaging floods that affect human beings and agriculture – the largest land user. As Favaro (2009) has further explained, a burgeoning population (around 155 million) is one of the country’s most critical problems, exacerbated by the shortage of water, food and land. Problematic rural conditions increase migration to already congested and under-equipped urban areas characterised by a severe lack of water supply, sewerage, drainage and mobility systems. The mushrooming slums constitute about 35 per cent of the population. When a town or community expands due to such urbanization, green infrastructure (such as green space and water bodies) is often usurped by built or ‘grey’ infrastructure, including transport, drainage systems, housing, and commercial/industrial developments; water channels are converted into underground drainage and sewerage box culverts, hidden underneath road infrastructures. Complicated by poor waste management, this may not only disrupt drainage patterns and create water logging ‑ with increased risk of flooding, but also leads to loss of water culture, biodiversity and other adverse environmental and health impacts, such as water-borne diseases (Asad and Ahsan, 2012). This is not only a problem for Bangladesh, but also many cities across Asia. For example, Hoa (2011) showed how 30 per cent of water bodies in Hanoi had been filled up by new construction, destroying the water balance and natural hydrology system. Thus, moving away from the traditional, locally based and context responsive water urbanism linked to natural hydrological processes can reduce climate change resilience and have other unintended consequences. In its Jakarta Declaration, the UN (2015) urged ‘formulation of pro-poor and informal sector focused strategies to manage urban risks and improve resilience, recognizing that disasters and climate change disproportionally affect the poor and marginalized’. It also encouraged ‘new and effective multi-level and collaborative governance systems to better manage the complex challenges of interconnected urban spaces’. Habitat III (2015) emphasised the need to ‘empower local authorities, local communities and community actors with appropriate resources, incentives and decision-making responsibilities’. In terms of urban governance, divided structures and unilateral actions by individual stakeholders and departments are often incapable of dealing with real world complexities and may overlook the knowledge, resources and ideas of local communities. This may result in lost opportunities for use of indigenous knowledge, decentralised and affordable solutions, job creation, and other social-economic benefits (UNESCAP, 2016). Inclusive approaches may be adopted at local community level and not only improve climate resilience but enable multiple co-benefits and ‘win-wins’. For example, as the ADB (2010) explained, human health and well-being encompasses a number of other aspects of the context, including water (clean water), waste management, food security, agriculture, social aspects (including jobs, living conditions), environmental and climate considerations, and infrastructure systems. Similarly, Habitat III (2015) urged a holistic approach to building urban resilience by pro-actively engaging expertise in economics, environment, health and related areas. As the OECD (2006, 28) emphasized, ‘benefits for the poor can be increased by coordinating infrastructure interventions with activities in other sectors, particularly priority economic sectors and those that build human capital (education, health, food security)’. The OECD added: ‘Priority should be given to strengthening the contribution of infrastructure to the MDGs [Millennium Development Goals] to exploit opportunities for joint initiatives and synergistic impacts’. As the ADB (2009: 92) emphasised, “better health care, access to safe drinking water, better sanitary conditions, and improved standards of education and infrastructure are ‘win-win’ measures that, while useful in their own right, will also enhance the region’s adaptive capacity” (ADB, 2009: 93). Accordingly, a major challenge for infrastructure policy makers and planners is to think well beyond their sectors and engage in dialogue and planning with other sectors and a broad range of stakeholders (OECD, 2006). Systems thinking helps us understand how various elements of climate resilience may be interconnected and linked to other systems for community development. A system is a group of interacting, interrelated components that form a complex and unified whole, with a purpose, boundary and performance indicators. We can adjust our viewpoint of a system, akin to a camera; ‘zoom out’ to view a particular system within the context of a wider system, to find connections and synergies; or ‘zoom in’ for closer analysis of a sub-system (Dewey, 1910; Metcalfe, 2007). In this regard, Ackoff (1971) saw sub-systems as functioning in service of the next level system e.g. the purpose of the heart is understood in relation to the circulatory system. He advocated looking beyond the boundaries of a particular system to open up opportunities for efficiencies and innovation. Soft systems methodology (SSM), as explained by Checkland (2001) and allied to ‘critical system thinking’ (Jackson, 2006), is a means of analysing and understanding a context-based ‘problem situation’, accommodating various views of diverse actors, examining possible alternative actions, and pursuing ‘purposeful activities’ towards a ‘desired future’ (Joham et al., 2009). These frames of reference assist in the study of the following case study ‘problem situation’, considering alternative views and approaches, and uncovering holistic, system solutions. The City of Khulna was selected as a case study because it is at a critical stage of its history and growth, with the potential and urgent necessity to intervene and transform its development direction. Khulna is the third largest city in Bangladesh, with a population of about 1.4 million, and evidences a ‘glorious and remarkable heritage’ (Ahsan et al., 2012). After previously relying upon river-based trade around the river port, it emerged as an industrial city. Nowadays, its urbanised area is growing rapidly due to rural-urban migration. As a result, the city has about 520 overcrowded slums, housing about 20 per cent of its population, of which 70 per cent migrated from the surrounding rural areas. By occupying left-over spaces and low-lying land, these face severe flood risk and drainage problems. An important characteristic of Khulna, which is located on the banks of the Bhairab/Rupsha, Atai and Atharabanki rivers, is its extensive natural drainage patterns (Fig. 1). As Rekittke (2009: 670) pointed out, thousands of made-made ponds are another special characteristic of the city’s urban tissue, which have potential as ‘urban building blocks’ (Fig. 2). While these combine the characteristic of an inner-city landscape element with a great variety of practical functions, increasing urbanisation and the pursuit of higher densities has resulted in many having been filled in and lost. In addition, the Khulna Master Plan emphasises a shift from water-based to road-based urbanism, with little attention to the water network. As Favaro (2009: 792) states, water urbanism is ‘not taken into serious consideration as an economic structure and possible economic driver in the region’. In doing so, she adds that ‘the master plan seems to neglect the fact that this region was, and still is, primarily an agricultural and water-based society’. The shift from community based approaches to technologist-government based water management, introduced during the colonial period and still gaining precedence, have ‘destroyed indigenous water knowledge’ (Kamal, 2006). This problem is exacerbated by the common practice of engaging outside ‘experts’ to develop water management solutions, as part of ‘technical assistance’ programs. For example, the ADB and the Government of Bangladesh conceived a project, ‘strengthening the resilience of the water sector in Khulna’, in October 2008. The ADB (2010: i) then engaged consultants to ‘assess the impacts of climate change on drainage, water availability and the salinity situation in Khulna City and to make recommendations to make the system more resilient to climate change’. The project activities encompassed three main components: socio-economic analysis, climate scenarios, and mathematical modelling. In addition to topographic and hydrometric data, socio-economic data was gathered via household, urban planning and public health surveys. The consultants rightfully highlighted the ‘increasing threat of the vulnerable population of Khulna to hot spells, flooding, water logging and salinity and scarcity of safe water’ (ADB 2010: ii). The contribution of other factors to human health, including food, environmental, climatic, agricultural, infrastructure, social and waste, were also considered. The climate resilience of the urban drainage system could be strengthened by increasing the conveyance capacity of the drains and outfall capacities of several outlets. Moreover, as the current drainage system is inadequate…improvement of the drainage system would be a robust strategy and is urgently required. Adaptation costs were estimated to be $12 – $17 million, on top of the base investment. A preliminary cost-benefit analysis ‘proved that the adaptation measures are economically justified’ (ADB, 2011: 32). Such strategies were discussed with stakeholders, including Khulna City Corporation (KCC), various government agencies and NGOs, ‘to assess the level of public acceptance’ (ADB, 2010: ii). However, the consultants observed with concern ‘a general lack of knowledge and interest among all concerned’ (ADB, 2010: vi). Although socio-economic surveys were conducted, focus-group discussions held, and public health concerns highlighted, there appears to have been insufficient engagement with local communities and the informal sector; this seems to have resulted in grassroots responses being overlooked and not integrated in the adaptation recommendations. While acknowledging that such responses alone are ‘inadequate during extreme events’, Alam et al. (2015: 2031) emphasised that ‘the importance of community-led adaptation can never be ignored’. Such decentralised, informal adaptation practices are now examined in the following section. In pursuit of context responsive climate resilience with co-benefits, Novotny et al. (2010) advocated a ‘soft engineering’ approach, as a replacement of ‘hard engineering’ (Goubert, 1989), in the planning and development of water-based cities, as a way to work with the forces of nature to reduce or mitigate the impacts of climate change and natural disasters. Such approaches may be adopted at local community level and not only improve climate resilience but enable multiple co-benefits and ‘win-wins’. The reduction of poverty is more likely to be assured when the poor are empowered to participate effectively in pro-poor interventions (Massuanganhe, 2014). Khulna already has indigenous and decentralised ways of managing water; the strategies include irrigation, communication, social gathering, water filtration/purification, water harvesting, and means of flood protection that are community driven. The following are some examples drawn from the literature and field observations. In terms of ‘soft engineering’, Favaro (2009) highlighted how landscape plays a critical infrastructural role, as much as large ‘concrete’ infrastructure. For example, the indigenous ‘overflow irrigation system’ involving ‘cut and fill’ associated with the urban ponds (Fig. 1) is essential in balancing the amount of permeable and impermeable surfaces and for offering safe, high land (Favaro, 2009: 791, 794). Household ponds may not only be used to manage floods, but also as productive landscape such as household food production (Fig. 2). In addition, in contrast to the traditional sewerage system, ‘the use of aerated lagoons could improve health conditions, provide water and natural fertiliser for agriculture, and increase productivity for fish farming’ (Favaro, 2009: 797). This could be coupled with a plantation program to re-establish the local ecology. Moreover, Chowdhury and Moore (2015) studied a number of indigenous ‘floating agriculture’ projects; these supported farming communities to adapt to waterlogged conditions by allowing vegetable production for daily consumption, income generation, community mobilization and increasing land-holding capacity. Salinity is the major problem in the south-western coastal belt of Khulna city. To overcome water salinity, local people of ‘Gabura’ thana in the Satkhira district use dedicated ponds for water purification at community level. They keep the water in the ponds for siltation for 20-30 days untouched, and introduce special types of fish that devour saline particles in the water. After elapse of the required time, the water becomes suitable for household works, but does not reach potable drinking quality. In local language they term it as ‘dudh pani’, which they use mainly for cooking and washing dishes. Similarly, to overcome water shortages due to prolonged dry weather, and increased salinity, Islam et al. (2014) investigated the prospect of rainwater harvesting, integrated with housing and utilizing indigenous materials, as a low cost alternative potable water supply option in the Satkhira district of Khulna. As Rikittke (2009: 674) explained, the ghats (terminals or access points) are invaluable components of the informal transport system on water, but have not received investment by the city administration; a series of low-cost interventions could enable the ghats to become safer, more effective and convenient. As Saha and Alamgir (2013: 815) described, to ensure a sustainable wastewater treatment system, ‘an integrated assessment of each option based on its economic, environmental, social, health and institutional aspects is necessary’. Although not categorised as ‘indigenous’, a decentralised system for collection, treatment and disposal or reuse of wastewater from the People’s Pachtala Colony of Khulna City was devised, with the support of a non-government organisation, Water Aid. Combining aerobic and anaerobic treatment processes, the basic idea is to treat the wastewater (where possible, together with refuse) on-site by means of low-cost treatment systems, making direct use of resulting products (water, compost, biogas). The system is low maintenance since most important parts operate with electrical energy. For successful functioning of the system, a community managed operation and maintenance system has been designed (Saha and Alamgir, 2013). The various indigenous and community based practices and possibilities described above exhibit common elements including: understanding of local contexts; respect for local culture and environment; and ownership and involvement of local actors and cooperatives. Integration of local infrastructure systems, such as wastewater treatment and energy, housing and water harvesting, aerated lagoons to treat sewerage and provide fertilizer, provided opportunities for multiple co-benefits; these included flood and drought resilience, water purification, waste management, food production, with improved health, local employment and other win-wins. Unfortunately, as Favaro (2009: 791) has highlighted, other indigenous water practices have been abandoned and ‘the water management issue has become secondary to large investment infrastructure projects’. As already acknowledged, such grassroots approaches may represent effective adaptation during typical hazards, but have limitations in extreme events (Alam et al., 2015). In this regard, Nielsen (1999) advocated combining bottom-up and top-down strategies, instead of viewing these as incompatible. We now consider opportunities for integrating such indigenous, decentralised, informal practices with more centralised, formalised climate responses, such as the technical, engineered solutions for Khulna, described above (ADB, 2010; 2011). The latter sought to strengthen adaptation resilience by increasing drainage and outfall capacities, such as by new drains and deepening existing channels. However, ‘hard’ engineering approaches tend to be linear, sealed, mono-functional and ecologically dysfunctional, compared with ‘soft’ approaches that are meandering, diverse purposed, and exhibit viable biota and functional ecology (Novotny et al., 2010). Arguably, restoration and conservation of the soft, natural water ecosystem, combined with enhancement of the indigenous adaptation system of household ponds, could have been more effective in yielding climate resilience, health and other ‘system’ benefits such as local employment and poverty alleviation. In combining formal with informal approaches, there is certainly an important role for ‘system dynamics modelling’ (Simovic, 1996; Balijepalli et al., 2015; Davies, 2015), as employed by ADB (2010; 2011) and its consultants in Khulna, to understand and visualise the problem, determine ‘hotspots’, and illustrate various scenarios and options. However, it is imperative to interpret such models for local community actors and to empower them in the decision-making processes. It is often taken for granted that small-scale technologies are incompatible with large-scale systems, and the small-scale system is not seen as a solution for solving critical problems within the established system. However, by bringing together various technical and grassroots actors in a workshop situation, Nielsen (2009) enabled various viewpoints to be presented and opportunities for common approaches explored. As Murtaza (2014) pointed out, Khulna has approximately 36 government, semi-government and private organisations. As they are different bodies, their thoughts and ideas for improving the city are different according to the uncoordinated rules and regulations that govern their actions. Sowgat (2012: 1) expressed a similar view: ‘many actors are active in the spatial development of Khulna, but their efforts are uncoordinated, with public agencies playing a limited plan-making role’. 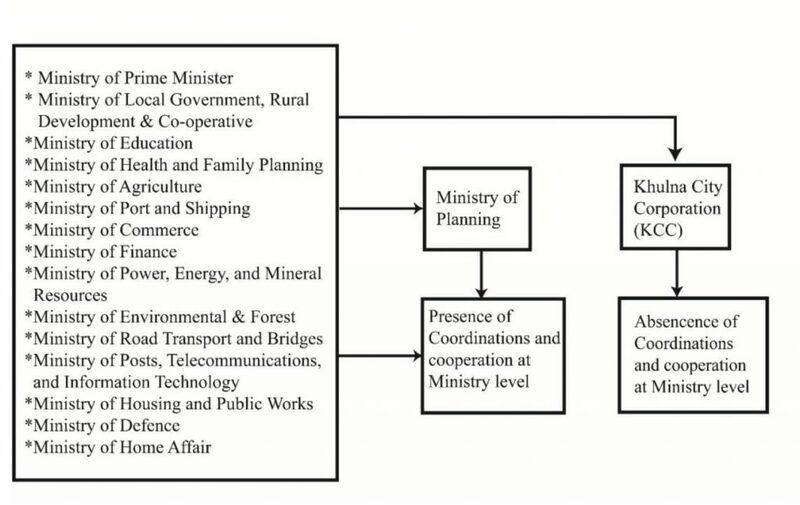 As Murtaza (2014) explained, the main problem is that although the various ministries are coordinated by the central Ministry of Planning, there is a lack of coordination of these ministries at city level (Fig. 3). Due to the absence of an active governance process, KCC lacks legal authority to oversight or control other organisations. For this reason, there are inequalities found in allotment of funds for construction, maintenance and other purposes, and ultimately in opportunities for citizens (e.g. see Raven, this issue). As a result, the gap between expectations and outcomes is increasing day by day. Insular, sector specific thinking among different agencies looms as a major barrier to be overcome, as is the case in many other jurisdictions. In the regard, the UN (2011) has promulgated holistic approaches to infrastructure systems that bring together different actors, enabling them to understand the connections between their various programmes and projects, and how coordinated approaches may uncover synergies with mutual benefits (Ness, 2014; 2015). For example, climate/flood resilience of Khulna is not only a matter for the Ministry of Public Works, but also the Ministries of Education, Health, Agriculture, Commerce, Finance, Environment, Road Transport and others. As we have seen, a holistic system perspective of resilience encompasses water, awareness raising, food production, employment and social enterprises, ecosystems and the relationship of watercourses and transport ‑ including water-borne transport (Ness, 2014). The City of Khulna also faces the challenge of developing an inclusive system of city governance to overcome the proliferation of organisations, all with their own ideas for transforming the city, and to foster ‘democratic decentralisation’ of local communities involving transfer of decision-making powers and resources. As Massuanganhe (2014: 63) noted, ‘programmes of decentralisation accompanied by efforts to promote greater power and autonomy in decision-making for local communities can offer genuine opportunities to improve outcomes’. In response to the research questions, and by means of the Khulna City case study, this preliminary study has identified and examined indigenous and formal responses to climate change (RQ1). There was little evidence of these different levels of response being integrated, although that was the intention of various international protocols (RQ2). The study has illustrated the potential benefits of integration in terms of resilience and co-benefits (RQ3). A synergistic, systems approach may enable increased climate resilience coupled with socio-economic win-wins. In addition, this may be achieved more efficiently and effectively by devolution of water management accompanied by integrated, small-scale, decentralised infrastructures that employ traditional indigenous practices, in combination with certain large scale works (ADB, 2010; 2011). A series of examples of indigenous and decentralised solutions to flood management (by use of ponds), wastewater treatment, water transport and water harvesting were presented. These all demonstrated opportunities for co-benefits, covering health, environment, food production and the like. A more coordinated, inclusive and devolved system of governance was seen as a prerequisite. The combination of different devices within integrated systems could open up new opportunities. For example, the water system can be used not only for production and irrigation, but also for energy production, mobility and purification infrastructure, especially via decentralised approaches. In contrast to the traditional sewerage system that is ‘costly, mono-functional and inflexible’, the use of aerated lagoons could improve health conditions, provide water and natural fertiliser for agriculture, and increase productivity in fish farming’ (Favaro, 2009: 797). The ecology of the region may also be re-established through a plantation program. Thus, we can see how a wider system perspective may enable the connections between various sub-systems to be identified, and creative synergies uncovered (Xing et al., 2013; Zhu et al., 2015). The study has indicated that the cost of large capital investments could be partially offset by smaller, distributed and locally managed infrastructure systems at the community level: This approach seems especially relevant for developing countries and presents an opportunity for involvement of the urban poor, both in the development, construction and management of such systems and in their use (Zaldi, 2001). It is also likely to be more cost and eco-efficient to foster decentralized, small-scale infrastructures close to the community they serve (Ness, 2007). The paper has illustrated how infrastructure solutions cannot be found in isolation from their socio-economic, cultural and environmental context. In the context of Bangladesh, and using the City of Khulna as a case study, the article highlighted the importance of empowering local communities and employing indigenous knowledge and traditional practices in achieving climate resilience and more. The paper has concentrated on small-scale, localised infrastructure systems that employ grassroots responses. As Alam et al. (2015) concluded, ‘such responses’…have limitations in extreme events’. Nevertheless, ‘adequate recognition of grassroots responses will not only inform better adaptation but also contribute to broader regional development planning and climate change policy context’ (Alam et al., 2015). Integration of formal, centralised and informal, decentralised approaches to climate adaptation may not only improve flood resilience, but also contribute to other community objectives, including health, food, environmental, employment and other co-benefits. Moreover, the article has illustrated how integrated, localised and synergistic approaches to infrastructure systems could further these objectives. In addition, the key roles of governance and empowerment of local communities have been highlighted as pre-requisites to planning and implementation of integrated approaches of infrastructure and community development. The authors have sought to highlight the importance of these approaches in increasing the climate resilience and prosperity of cities in the developing world, especially those such as Khulna that are located in low lying delta areas, facing the serious challenge of increasing urbanisation coupled with high vulnerability to the effects of climate change. With wider support, Khulna has the opportunity to pilot the integrated approaches advocated in this article, and to become a model for other cities facing similar challenging circumstances. It is hoped to elicit the support of other partners for continued, more in depth research in this important field of study and its application. ADB (2009) The economics of climate change in South East Asia. Manila: Asian Development Bank. ADB (2010) Bangladesh: strengthening the resilience of the water sector in Khulna to climate change. Bangladesh and Netherlands: Institute of Water Modelling / Manila: Asian Development Bank. ADB (2011) Adapting to climate change: strengthening the climate resilience of water sector infrastructure in Khulna, Bangladesh. Manila: Asian Development Bank. Ahsan, S.M.R., Asad, R. and Alam, A. (2012) Urban regeneration for sustainable economic growth: the study of Boro Bazaar in Khulna, Bangladesh. Journal of Social and Development Sciences, 3, 4, 111-122. 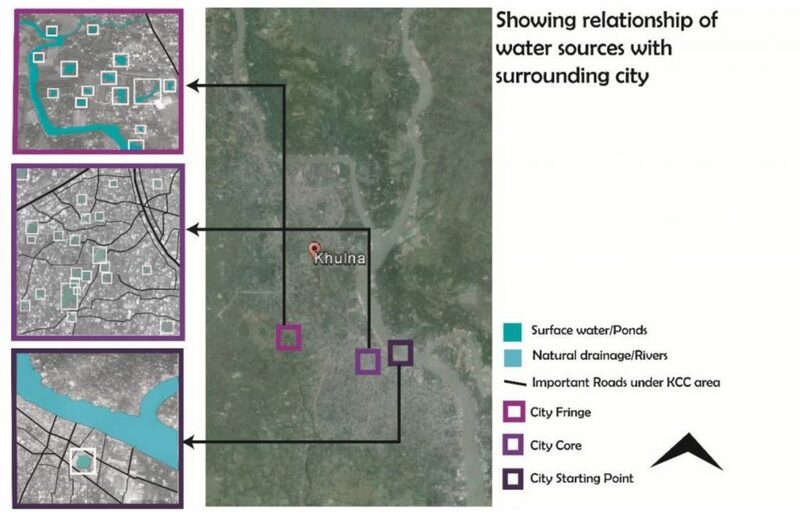 Asad, R. and Ahsan, R. (2012) Structuring urban sustainability with water: a case of Kamrangir Chor, Dhaka, Bangladesh. Journal of Social and Development Sciences, 3, 8, 293-303. Favaro, S. (2009) Remoulding topography. In: The New Urban Question – Urbanism beyond Neo-Liberalism, Proceedings of 4th International Conference of the International Forum on Urbanism. Amsterdam/Delft. Goubert, J.P. (1989) The conquest of water: the advent of health in the industrial age. Polity Press. Habitat III (2015) Issue Paper 15 – Urban Resilience, 31 May. New York: UN Habitat. Hoa, T.Q. (2011) Water resource management for Hanoi city under the impact of urbanization and climate change – Prospects and challenges. Expert Seminar ‑ Regional Urban Networks: Urban Environmental and Risk Management in Southeast Asia, Philippines. Kamal, A. (2006) Living with water: Bangladesh since ancient times. In: T. Tvedt, E. Jakobsson (eds) A history of water: water control and river biographies (Vol. 1). London, Tauris & Co. Ltd, 194-213. Murtaza, M. G. (2014) Khulna city in the context of citizen problems and urban planning. Khulna, Bangladesh: Rupantar Printing and Publications. Ness, D. (2007) Smart, sufficient and sustainable infrastructure systems. Background paper – UN Expert Group Meeting, Bangkok, 11-13 June, United Nations Economic and Social Commission for Asia and the Pacific, May. Ness, D. (2014) Connections and synergies between parts of cities: doing more with less. In: T. Akashi, A. Abiko, B. Giddings, M. Gjerde, and P. Lahti (eds) The Accessible City. CIB Publication 398. OECD (2006) Promoting pro-poor infrastructure, from: Promoting pro-poor growth ‑ policy guidance. Organisation for Economic Cooperation and Development. Parry, M.L., Canziani, O.F., van der Linden, P.J. and Hanson, C.E. (2007) Climate change 2007: impacts, adaptation and vulnerability: working group II contribution to the fourth assessment report of the IPCC Intergovernmental Panel on Climate Change. Cambridge/New York: Cambridge University Press. Rahman, A., Alam, M., Alam, S., Uzzaman, M., Rashid, M. and Rabbani, G. (2007) Risks, vulnerability and adaptation in Bangladesh – Human Development Report 8. UNDP. Rekittke, J. (2009) Grassroots landscape architecture for the new informal Asian city, The New Urban Question – urbanism beyond new liberalism. Proceedings of 4th International Conference of the International Forum on Urbanism, Amsterdam/Delft. 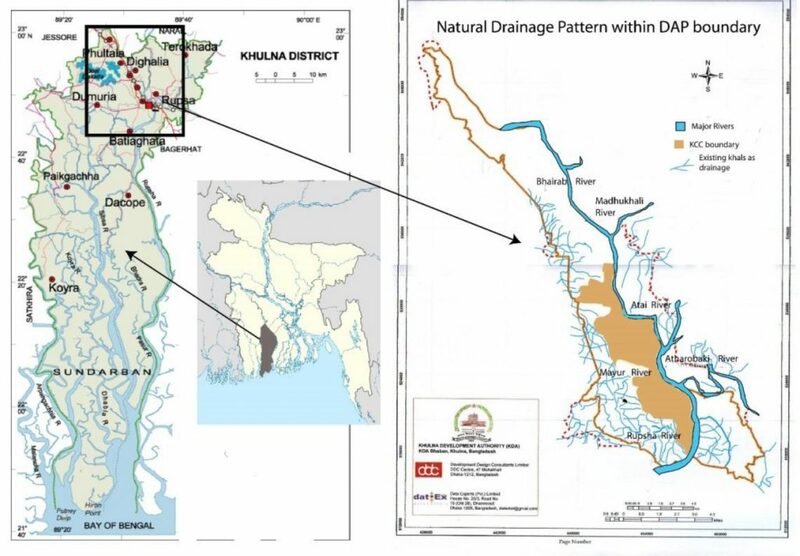 Saha, S. and Alamgir, M. (2013) Wastewater quality at different stages of decentralised wastewater treatment process in the Peoples Panchtala Colony at Kalishpur, Khulna. International Conference on Mechanical, Industrial and Materials Engineering 2013 (ICMIME2013), 1-3 November, RUET, Rajshani, Bangladesh. Shannon, K. (2008). South Asian Hydraulic Civilizations: India, Sri Lanka, Bangladesh. In: K. Shannon, B. De Meulder, V. d’Auria & J. Gosseye (Eds. ), Water urbanisms (Vol. 1). SUN architecture. Sowgat, T. (2012) Pro-poor planning in Bangladesh: a case study of Khulna City, PhD dissertation. School of Built Environment, Heriot-Watt University, UK, October. UN (2015) The Jakarta declaration for Habitat III: sustainable urbanisation to accelerate development. Jakarta: United Nations, 22 October. UNESCAP (2016) Water-resilient sustainable cities: development of efficient urban water management strategies in Asia and the Pacific. Module 2/5 of e-Learning Course: Integrated Water Resource Management Applications. United Nations. Zaldi, A. (2001) From the lane to the city: the impact of the Orangi Pilot Project’s low cost sanitation model. London: Wateraid Report.